Altoids Peppermint Flavor Mints in 1.76oz (50g) Tin. The original Celebrated Curiously Strong Peppermint artivicially flavored mints. 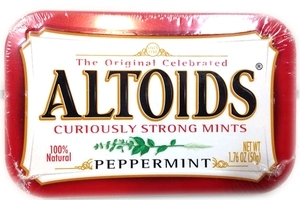 Altoid Peppermint Mint is fierly addition to the Altoids family is certain to heat up the mint category and tempt curiously strong fans everywhere. Product of England. Shirakiku Ramune (Lychee Flavor) - 6.76 fl oz.